To make ice cream at home is easiest if you have a special tool - the ice cream maker. This device is able to regularly mix the cooled mass, which is what you need to get a delicate dessert without ice crystals. However, it is possible to achieve such a result and manually. Homemade ice cream is good because it is always precisely known composition (unlike a factory product that can season with preservatives and obscure quality thickeners). Recipes are a lot better to start with ice cream without eggs in case of fear of poisoning. Mix 100 g sugar with 35 g of milk powder, mix all in 250 ml of milk and boil. When the liquid seethe, pour a mixture of 50 ml of milk and 10 grams starch. Reduce heat and, stirring, allow to thicken, then cool. 250 ml cream 35% fat content and cool whip and then fold in the broth. Put in a bowl with low sides and place in freezer. Every 15-20 minutes remove and stir vigorously with a whisk or blend in a blender until the mixture reaches the desired density and temperature. Or pour the finished mixture into the ice cream parlor. 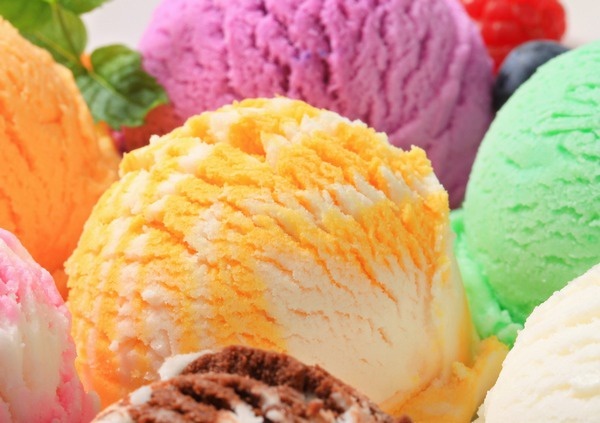 You can make homemade ice cream without the cream. To do this, take any seasonal or frozen fruits and berries, cleaned from skin and seeds, mixed with an equal volume of yogurt (better to use homemade) and add sugar to taste. The mixture is left to blend and freeze. If there is no desire to frequently stir the product, it is better to buy a special small portion molds. They ice cream hardens quickly and evenly. For fruit dessert suitable currants, strawberries, raspberries, peaches, apricots, apples, etc.